Toto Wolff said "class act" Lewis Hamilton is "more complete than ever" as he closes in on a fifth Formula One world title. Hamilton will match the great Juan Manuel Fangio's tally of F1 titles if he wins the United States Grand Prix on Sunday and Sebastian Vettel fails to finish second. The Brit has won six out of the last seven races to stand on the brink of retaining his crown. Mercedes boss Wolff paid tribute to the 33-year-old, who became only the second driver to win 50 races for one team when he took the chequered flag at the Japanese Grand Prix last time out. A stunning victory for @LewisHamilton and P5 for @ValtteriBottas secures our fourth Constructors title! 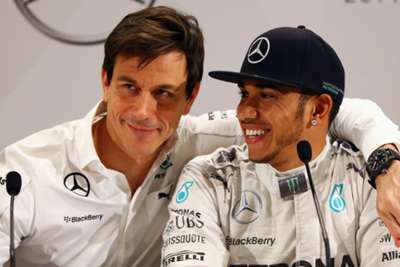 "With six race victories in the last seven races, Lewis has shown what a class act he is," said Wolff. "Valtteri [Bottas] had some tough races in the summer, but came back strong in recent weeks. He was competitive in both Sochi and Suzuka and embodied our team spirit.